2018 is almost here and what better time to start blogging with your students. We know there are many educators who see the benefits of blogging, yet feel like they need support to get started or improve their program. We have an amazing FREE opportunity starting January 15th, 2018! Please note: registrations for this course have now closed. We will let you know of future opportunities for supported courses! In the meantime, check out our Teacher Challenges for free self paced professional learning. Unlike our self-paced Teacher Challenge professional learning series, this program will offer you a ten week fully supported course. Each week you will be personally emailed information to set the scene for the weekly topic. A blog will be used for learning, connecting, and reading published course content. A closed Facebook group will be used for discussion and collaboration. We will be focusing a little on the technical side of blogging and a lot on the pedagogy, process and potential of a high quality blogging program. This course is designed for educators from anywhere in the world who are working with students. Teachers who use a blog with their class but feel like they could do it better. Set up a class blog and create quality posts, pages and comments. Use your blog as an online hub and incorporate a variety of online tools in a meaningful way. Connect your class blog with students, parents and the world to enhance learning outcomes. Me! My name is Kathleen Morris and I’m an Australian primary school teacher. I started blogging with students in 2008 and I love helping other educators learn more about blogs. You can read more about my story in our Global2 post. We will also have support from our fantastic team at Edublogs and some other members of the educational blogging community. REGISTRATION OPENS: Now! Scroll down to find our registration form. REGISTRATION CLOSES: January 14th or earlier. We will only be able to accept a limited number of participants so we can provide support to everyone involved. Get in quick to avoid missing out! WEEK ONE: Begins Monday January 15th. WEEK TEN (FINAL WEEK): Begins Monday 19th March. Why Are We Running A Free Course? Edublogs is run by teachers for teachers and we have always had support at the forefront of the service we provide. For example, we offer all our Edublogs and CampusPress users free 24/7 email support. Our self-paced Teacher Challenge courses have been popular with educators for many years. These are not going away and we will continue to monitor and update them. If you prefer to work at your own pace and pick and choose what you want to learn about, these are the courses for you. We know there are many educators who would like coaching, support and accountability to set up a class blog that will enhance their students’ learning. This is exactly what Better Blogging With Students will offer. As well as having me as your own coach, you will have the advantage of a likeminded community through our private Facebook group! Apart from the following essentials, all you’ll need to bring to this course is a willingness to learn, share and connect! You certainly don’t need advanced skills with technology. As long as you can navigate your way around the internet, you’re good to go. A blog! If you haven’t already set one up through Edublogs or CampusPress, you can check out our quick start guide, or simply set up your blog in week one. A Facebook account. It will only take you minutes to sign up for Facebook if you don’t have an account already. And if you aren’t interested in using Facebook publicly or befriending anyone, that’s not a problem. You only need the Facebook account to access our private, closed group (only our group members will be able to see what is published in there). All participants in our ten week course will be issued with a certificate of completion that outlines the modules covered and the time frame. We expect to have participants from all over the world. Naturally, different schools and districts have different criteria for awarding professional development credit. Therefore, we can’t guarantee our certificate will comply with your school’s specific PD criteria. But we hope it does! This will be an amazing learning opportunity. You can relax and look forward to the fun beginning on January 15. We’ll be emailing you a few days before the launch of our course with the course overview, links to our blog and Facebook group plus everything else you need to know. Feel free to share this information with any friends or colleagues who might be interested. Please leave a comment if you have any questions about the course. We have set up a class blog and some of them have approved post. Is there an easy way to approve post? It takes for ever and you have to wait in between approving every thing. Great. I am trying to set up a class blog and have all my students join edublog.org. We are on our way but have hit a couple of snags. Fantastic. You’re in the right place! I have attempted to complete the registration but have not received a confirmation. Can you please let me know if my registration worked? Really looking forward to this course – it is just what I have been looking for! So glad this is the sort of course you have been looking for! It’ll be fun. Don’t worry, I just checked and I have all your details. We are just doing some finishing touches on the blog today so hoping to send out an email later today with all the details for participants. Hi, I just filled out the registration form, but have a nagging feeling I may have already filled it out before Christmas. Apologies if my information is in your database twice. Take my enthusiasm for registration as a compliment! Keen to try out something new! Looking forward to learning how blogging in the classroom works and learning a new way to engage my students in cross classroom learning! Fantastic, Naomi! I hope your students really embrace it. I’m sure they will. Hi, what time of a Monday does the course take place? So at the start of the week we will send you an email with an overview of the weekly topic to set the scene. You’ll get the link to a post on our private blog with lots of info about our weekly topic (reading materials and sometimes a video too). You can read this post and complete the task at your own time. Then, if you’re keen, you can head over to our private Facebook group and join in the conversation with lots of other participants. So the great thing is, you can go through the materials at any time that suits you during the week. What is the Facebook page please? Both a colleague and I have already registered, but neither of us have received any kind of confirmation. When will we be notified about what we are doing? Looking forward to being able to understand blogging and use it with my byo iPad class. Fantastic! I hope 2018 will be a great year for blogging in your class. With your guidance I hope it will be!!!! You’re welcome! I love helping others learn about the wonderful world of blogging. I’m looking forward to finding out how I can use the blog with my class and the school community. It’ll be great to connect with you, Michelle! I have been learning online for some years now and I am also interested in learning about blogging….. and what I can do with my students of English. Sounds great, Tiziana. We look forward to welcoming you into the group! I need to get this approved for district PD credits. Can you please tell me how much time one would expect to commit for course completion? We’d like people to commit 1-2hrs/week to the course (although some people might put in extra time working on their blogs and engaging in discussions, of course). We could reasonably say 20 hours for PD credits. Hope this helps? The time commitment will be a little flexible. We expect you’d want to dedicate 1-2hrs/week to going through course materials, checklists and engaging in discussions etc. Anything on top of that would be up to you depending how much time you have. I imagine the amount of additional time people will put into working on their blog and engaging in discussions will vary considerably. Very excited to be a part of this course! Thanks for getting on board, Keith! I’ll be free to help if you want, especially as the student blogging challenge will be starting in early March 2018. We are going 1:1 Chromebooks next year in Year 6 after having no tech at all. Looking forward to joining the 21st century classroom. Looking forward to learning about teaching kids how to blog. Cool! Thank you so much for teaching this course! I tried to access Edublogs on my iPad, but it says the developer needs to update. Does that mean Edublogs is for computers only? 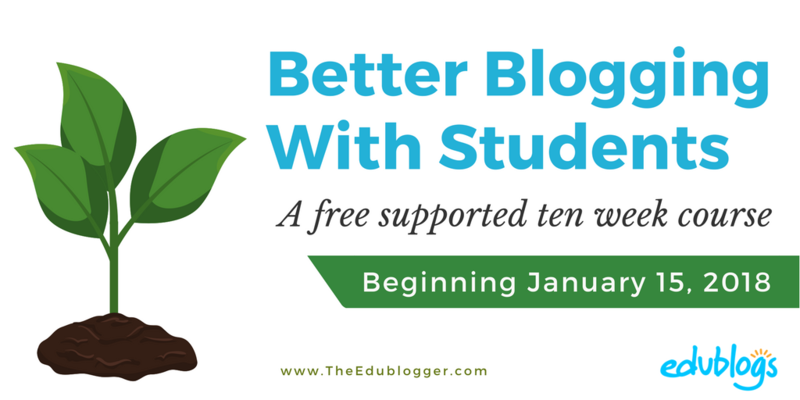 Don’t worry — you’ll still be able to use Edublogs. Send us an email at [email protected] when you get a chance and we can run you through everything.